The MF70 is a great machine and ideal for a beginner conversion. However, I soon found one limitation – the Y axis is limited to a tiny 48mm. I kind of assumed that the 70 in the name of the mill (and also the separate KT70 compound table) meant 70mm, but it seems not. A few people have com across this and developed their own solution – notably Retromaster and preconverted machines from Usovo. Whilst these look good and inspired me, one thing I didn’t like is the way the endstop and stepper motor seemed to hang even further off the machine than with a “normal” conversion. They also require a longer leadscrew. I’ve had a lot of trouble finding a suitable leadscrew replacement that isn’t really expensive. I even tried getting a replacement Y-axis leadscrew from Proxxon; it’s longer and also a right handed thread. I had an idea for a solution that I thought was a little simpler. Rather than moving the end stops further out, I’d reduce their size so that the table could slide over them. They’d still be used for fixing the end of the leadscrew but no longer stop its travel. Nobody else seems to have done this but as the leadscrew is attached only in the centre of the table it shouldn’t be a problem. Other conversions had proven that stability of the table wouldn’t be affected. It seems I’d fallen into the “trap” that most people do… the first things I mill seem to be parts for my mill! Never mind. This was the first piece I did as it was smaller and simpler. It’s milled from 5mm think aluminium and in place of the washer on the standard plastic piece it uses a sealed bearing. The leadscrew diameter is 6mm and the smallest bearing I could find had a 12mm outside diameter and 4mm thickness. Perfect. Following other people’s builds, it’s a standard radial bearing rather than a thrust bearing. For the small load it’s under that should be fine. Note the wooden practice piece; it’s far easier and quicker to check for fit using some easily cut softwood first. It was the first piece of metal I’d milled and I was running the feed rate a little too high, especially on drilling operations. I managed to break my 1mm mill, but I suppose that’s all part of the learning curve. It was pretty noisy too. I now wear earplugs whilst milling! Fitting this increased my Y axis travel from 48mm to a much improved 68mm! 2cm might not sound like a lot, but it makes all the difference. One thing I’m not keen on is that the shroud over the Y axis leadscrew no longer fits. 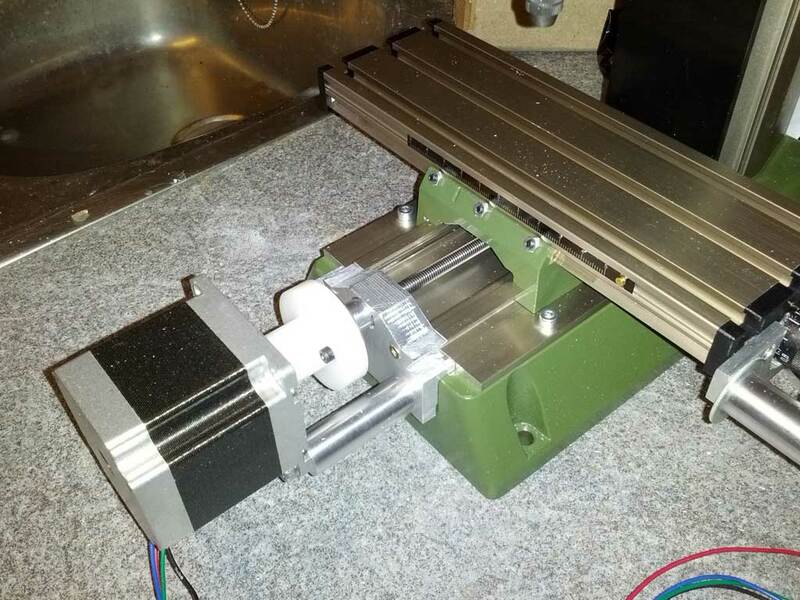 This means that all the swarf from milling can stick to the leadscrew and increase wear on the delrin under the table. This will probably lead to increased backlash. I’ve not noticed anyone else with a solution to this – including the professionally converted Usovo machines. Maybe something I’ll just have to live with. Now this was a more adventurous piece! It seemed sensible to make a similar piece and let the table slide over the front end stop. However, the difference between this and the rear is that teh stepper motors are mounted to it. Even if I created a piece, the two screws used for the diagonally mounted motor would foul the sliding table. Could I perhaps use a smaller NEMA17-sized motor rather than my NEMA23s? No. This would still cause a problem. 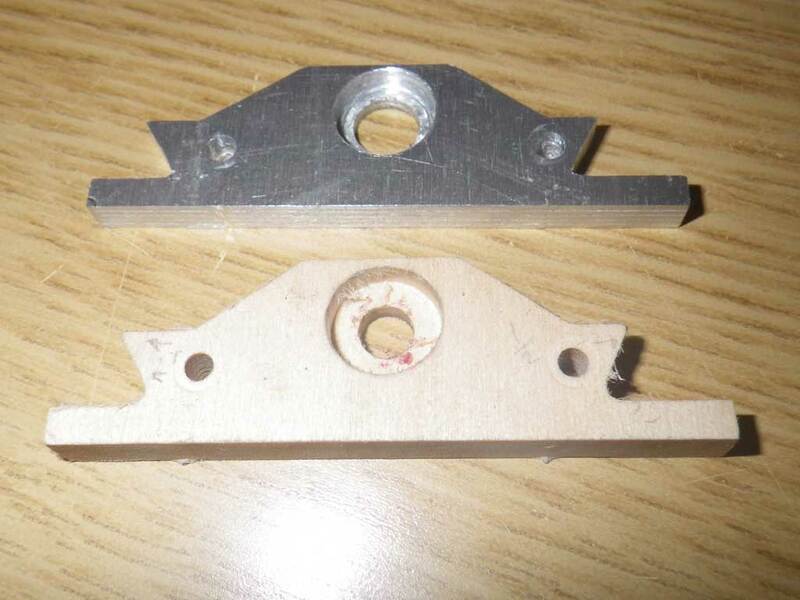 Some other conversions (Jarkman’s for instance) mounted the motor square rather than diagonally – here the bottom mounts would be fine but the top two even more of a problem. The I hit on the idea of using just the two lower mounts. Whilst it wasn’t supported evenly it looked no worse than some of the extended ones. I had to give it a try. The piece was milled out of a 15mm think chunk of aluminium. I was being a little overcautious with the feedrates and cut depths now and this took ages! I got very bored standing there with a hoover and a vacuum mount is well overdue. The thickness is for two reason. Firstly I had to cut 8mm off the back at the rear because the mill base sticks out a bit further than the table. Secondly, I wanted a firm mount for the motor (now into 7mm of metal). The bearing is set very deep in the piece. This time I used a bearing that is 13mm OD and 5mm thick. This gave a wide enough hole for part of the original handle to sit in. This is the end result. The mill now has a theoretical Y axis travel of 91mm. The limiting factor is now actually the distance between the spindle and the back of the mill which is 82mm. Whilst you could move the material 92mm, any piece of the work that would be millable at it’s full positive extend would hit the mill before it ran out of travel. All in all, I’m very happy with the result. I’ll attached the CamBam files for these pieces once I work out how to in WordPress. In the meantime contact me if you’d like a copy. Note that the tolerances are very tight. I decided to try giving the mill a bit more support on its travel so the piece may need a little gentle filing before fitting. 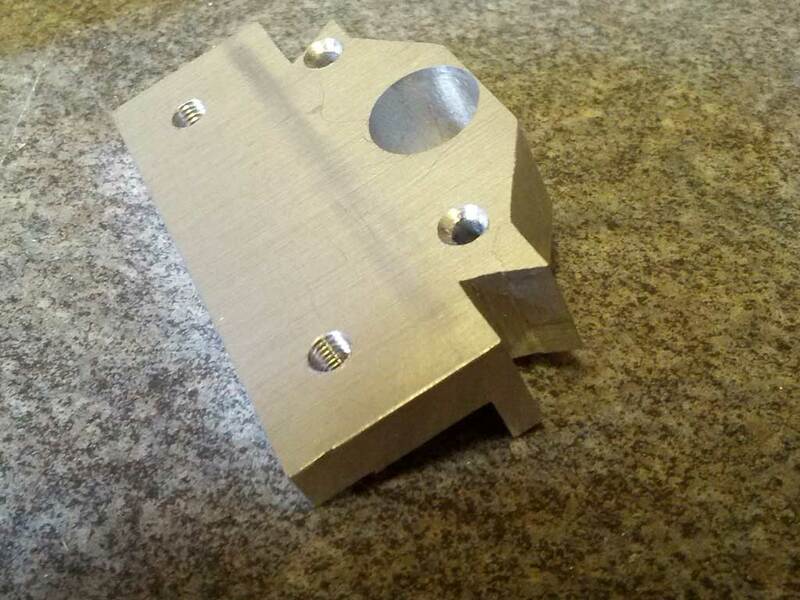 Also, the pieces have sharp internal corners and the tool radius means that a little filing will be needed here too. The reason for my CNC mill conversion was to enable me to make my own home PCBs. I’d done a few tests but had yet to actually make one that I was going to use. 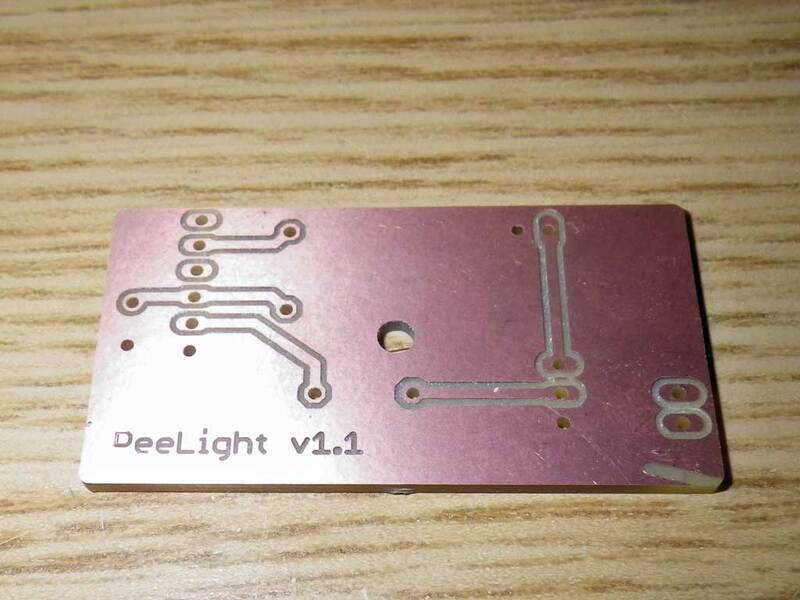 I thought I’d start with something simple and upgrading the ugly stripboard I’d used for the PeeLight seemed an obvious choice – it’s small and only used a few through hole components. Learning to use Eagle for PCB design took a little while. It’s not awful, but not the most intuitive piece of software either. I stuck with it because it seems a good choice if I later decide to send the design of to a fabrication house and have it done professionally. PCB-gcode is an add-in for Eagle and also takes a while to get the best from. I found there was lots of trial and error regarding settings before I got the sort of result I wanted. There’s a trade off with the diameter of the mill to allow you to do some fine work. Too large a bit and the software knows it won’t fit between two tracks so it doesn’t try and the pads aren’t isolated at all. Too small and you may find that it tries loads of passes where you do want a bit more isolation. I also tried lying about the size of bit – especially when some pads had a 0.08mm gap between them and I only had a 1mm endmill. Here’s the finished PCB. One thing I really like is how I can also cut out the board (including rounded corners), drill the component holes, drill any mounting holes and even engrave text with perfect alignment as it’s all done on the same machine without removing the workpiece. See if you can spot one mistake where I stopped the milling and tried to move the work without raising the tool. Most people use a V-shaped engraving bit for PCB routing, but I had varied results this way. I’m fairly sure my problems were down to the way I was holding down the PCB. I clamped it at the edges using the clamps supplied with the mill. The problems were two fold. The fact that my PCB wasn’t completely flat caused varying cut widths. Any gaps under the PCB where the clamps had made it bow upwards meant that the rotation of the knife-shaped 2 flute cutter caused vibration and gave ragged edges in places. I did have some excellent results, especially on smaller pieces, but not consistently. Then I tried using a 0.5mm endmill and got a much better result. Any slight variation in cut depth didn’t cause variation in width. The vibration also seemed to go, or at least didn’t matter. I will try the engraving bits again, but this seems to suit me for now. I’ve never been one for blogging. I’ve never been one for a vanity site with all “here’s my fascinating life” stuff. However, I keep finding that I need to stick up an image, document a project that someone else might find useful, or just have somewhere I can link to. There was a time – not so long ago – where the first step would be to knock up a database in SQL Server (21012 of course) and a custom blogging system using ASP.NET MVC (4 beta of course). I’d spend a few weeks on it and make sure it worked well from mobile devices. It’d be pretty slick. I’d probably post two things and nobody would look at it. My time’s a bit more scarce these days, so I’ve done the sensible thing and used someone else’s wheel. If I actually use it then I’ll rewrite the infrastructure. Also, Hackaday uses WordPress and I was impressed how it themed and worked well on an Android phone. What’s the matter? Don’t you like it? Tough. I’m a geek and proud of it. I was typing in a some hexadecimal the other day like we all do. I think it was 0xFFED. Maybe it wasn’t. And it dawned on me that FRED is almost valid hex. If we were all using duotridecimal (base 32) then I’d have been sorted. The things that spring to mind as likely tags are the things that have been keeping me busy lately – with one exception. I’m unlikely to blog about my adorable son Adam. It’s not that I dont’ care. It’s not that I don’t talk about him. I just that if you know me in person then you’ll know him. That stuff’s presonal – both in that I don’t want to share with people I don’t know and that you’re likely to not be bothered about some random person’s family. Suffice it to say he’s great and I don’t mind that more time with him means less time on geeky stuff. I hope he inherits some of my geeky interests. My wife doesn’t. General software development. My job is as a desktop developer – C#, SQL, Java, Oracle – but I’m not sure there’s much I’ll post about that. Other people have that pretty much covered. I’ve started getting some content up and decided to date it according to when it was done even though I only blogged it now. Hence the posts in the past. I hope that’s not too confusing.